Introducing new foods to your baby is an exciting part of being a parent. Your baby will delight you with her responses to the foods she enjoys and the foods she dislikes. 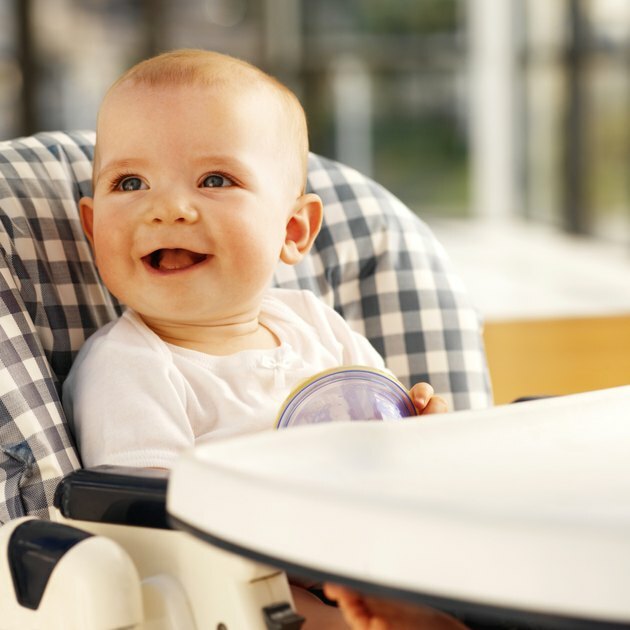 According to Kids Health, your 10-month old baby is able to feed herself finger foods and will benefit from a feeding schedule that allows her to sit at the table and eat regular meals and snacks with the rest of the family. Choose what times your baby will either eat meals and snacks or drink breast milk or formula. Consider your baby's hunger cues when determining the time your baby will eat during the day. Glade B. Curtis and Judith Schuler, authors of "Your Baby's First Year Week by Week," write that 10-month old babies should be eating a variety of foods spread out across meals and snacks, which breast milk or formula should be a part of. Feed your baby breakfast foods that provide energy and nutrition. Breakfast should be offered shortly after your baby wakes up. Curtis and Schuler recommend that your baby eat a combination of fruit and cereal as a healthy meal. Pureed baby food is a safe option, says Kids Health, but finger foods can be introduced as well. Make sure they are soft and easy to gum. Cut foods, such as whole grapes and other fruits, into small pieces to prevent choking. Dry cereals should be introduced to your baby's feeding schedule because they encourage fine motor skill development, which will be necessary for using eating utensils. Offer your baby a lunch that includes a variety of foods from different food groups. Lunch should be offered in the middle of the day to provide energy to last your baby throughout the afternoon. Your baby will likely show interest in the foods that the rest of the family is eating and you can offer her many choices at lunchtime. Curtis and Schuler recommend cooked pasta and bread as options. You should also include soft fruits and vegetables on her lunch plate to encourage healthy eating habits from an early age. Feed your baby a dinner that includes meat, vegetables and grains an hour or two before bedtime. Healthy Children, a website from the American Academy of Pediatrics, recommends offering lean meats, such as chicken, to your 10-month old to ensure adequate protein intake. Fruit is another recommendation for dinner time and you should serve different options than what your baby has already had to eat for her other meals. Soft vegetables, cooked potatoes and bread are additional choices. Offer your baby small snacks between meals to keep her satisfied. You can try teething biscuits, fruits, vegetables, cheese or yogurt to ensure a balanced diet. Breast milk or formula can also be served at snack time, says Healthy Children. Kids Health adds that you should avoid foods with empty calories, such as sweets and potato chips because they do not offer the nutrition that your 10-month old needs. Ensure that your baby is eating enough during the day. You can expect her to eat three meals and two snacks a day, say Curtis and Schuler. Meals will typically fall about four or five hours apart with a snack in between. Try to keep your baby happy and content by offering her snacks about two hours after she finishes breakfast or lunch. Babies eat when they are hungry and putting your baby on a routine will help her eat according to your schedule because her body will signal that it is time for food. Continue offering your baby breast milk or formula until she is at least one year of age. If you want to encourage her to eat more table foods, only offer her a bottle or cup after she has eaten her meal or snack. Remember that a rigid schedule will be difficult to stick to. Aim for feeding your baby at roughly the same times everyday to build consistency and good eating habits, but do not worry if she is eating a few minutes before or after the times you chose to serve meals. It is perfectly normal for babies to eat quite a bit one day and hardly anything the next day, but rest assured that if you offer her plenty of food, she will get what she needs.